Topics: Leaflets, Stationery & Forms, Book Printing, Presentation Folders, Digital Printing, and Marketing & Promotions. It is hosted by Freshwebdevelopment.com Ltd (England, Yorkshire,) using Apache web server. ns2.netmatters-server.co.uk, and ns1.netmatters-server.co.uk are its DNS Nameservers. 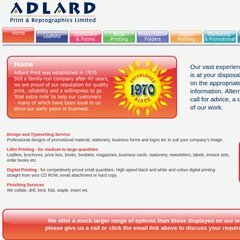 Adlardprint.com's server IP number is 85.118.232.145. PING (85.118.232.145) 56(84) bytes of data. Pinging the server, resulted in a 122 ms response.